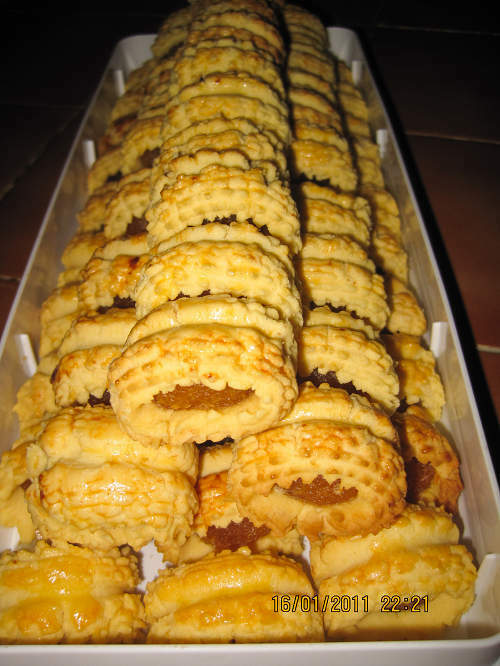 Pineapple roll tarts (aka pineapple cookies, or pineapple tarts) are considered as festive cookies, usually consumed during the Chinese New Year season, popular in Singapore, Malaysia, Indonesia, and Taiwan (Note: Taiwanese have their own pineapple cookies in rectangular shape), classified as of Nyonya food. Chinese like to have these cookies during Chinese New Year season because of the auspicious name, signifying success and prosperity, so they become as nearly must-served treats. The melt-in-mouth pastry outside is very addictive, with tasty pineapple jam wrapped inside. You can’t stop eating once you start to bite the first one. I’m so glad that one of my fans, Chooi Mei Lok submitted her creation on my Chinese fan page, that instantly attracted lots of responses. Thanks to Chooi so much for her generous sharing on both of my blogs. Please welcome Chooi. Here comes her recipe below. Shred pineapples finely and sift drip the juice till dry. Cook pineapple shreds over medium head till dry then add in sugar. Switch to low heat and keep stirring to prevent it from burning until golden brown and dry. Divide into small parts and form into balls, each weighted 7grams. Sift flours and custard powder together. Mix butter, icing sugar till creamy and fluffy, add in the yolk continue mixing. Fold in sifted flours and mix to form a dough. Leave aside for 30 minuets. Preheat the oven to 170C (335F). Put pastry into the mould and pipe 5cm length. Place filling at one end and roll up. Glaze with beaten egg yolk. Bake 15-20 minutes till golden brown. Leave to cool before storing. If you don't have any moulds, you might knead the pastry with hands into rectangular shape, or shape the pastry with cookie cutters. Simply roll the pastry dough into a disc shape first, enclose the filling inside, press to any shape you like. hi, looks beautiful, i like the nastar shape of these cookies, think they are very elegant too! I see that there are so many versions and variety of recipes over the blog for the past one week, it just makes me drooling looking at all of them. I never tried making them before, but I think I will try doing that with this method. Using my cookie press would be great for these. Your tarts looks beautiful and neatly done. I can only imagine how hard it is to carefully wrap the dough around the tarts, making sure that the indentations are not affected in any way. P.s. my favorite pineapple tart are the Taiwanese ones, how about you? Wow...that's a lot of pineapple tarts you made. These cookies are my favourite. Your pastry ingredients look very good with corn flour and custard flour. I haven't made any. Wish I can have some now! Brilliant idea to let your readers guestpost! More beautiful tarts! I must remember to get all these gadgets next time I head back for a visit. with hands into rectangular shape, or shape the pastry with cookie cutters." Would someone mind explaining it in a bit more detail for those of us who don't understand? Updated with more details for you. beautiful cookies! when is the New Year? 3rd Feb.(Thur) is the 1st day of Chinese New Year. Love pineapple tarts :-)) Those are a must-have during the CNY. Great looking pineapple tarts. Always a favourite during CNY. Happy New Year to you and your family. Hi, sorry, I don't know. These tarts were made by my fan, Chooi. My all time favourite! But not hard working enough to make it, just bought some and savour! These look definitely mouth-watering! Where can I buy the mold for the pineapple rols. Sorry, can't help you in ordering the mould, because I don't know where we can get them. These pineapple tarts were made by my fan, Chooi. I have used your Japanese Cheesecake recipe and it was a big hit to my family. I will make the Cantonese Egg Tarts very soon. Thanks! The white "mold" is a COOKIE PRESS and WILTON brand has it. You can buy it in any bakery supply or big grocery chains. I have a Wilton Cookie Press with 12 Cookie - design discs and Easy - squeeze trigger action. I hope it helps. Aw, love to hear that your family loved it. And I bet you must be a great baker. Thanks for recommending my blog to your friends! Sweet! Are there any alternatives to using pineapple?- some of my family members aren't too fond of that fruit. This is a popular snack for CNY. You might try other fruits for making fillings, I think. Hi Christine :) first of all i wanna thank you coz i tried your egg tarts recipe the other day and my dad loves it! :) so thank you very much. :) and i was wondering is it possible to subsitude custard powder here for making pineapple tarts to any other powder? For making the pineapple tarts, the custard powder is for adding colour and flavour, can't be replaced by any other powder. May I know when you refer to corn flour in most of your recipes, do you mean corn flour or corn starch? Pure corn flour and corn starch confuse me all the time. We call corn flour here in Australia, quite similar to corn starch in US. can i store the pineapple jam into the fridge to make it hardened/more sticky? Hi, is there any flour or powder I can substitue for custard powder? Custard powder contains cornstarch, salt and vanilla flavoring. You might try substituting it with the same amount of cornstarch (corn flour) yielded by the recipe and add a bit of vanilla extract. It's easier if you've got an electric mixer. It won't take too long to beat the butter and sugar until fluffy, only about a minute or so. I tried your recipe but the pineapple tarts cracked when they came out... is it too dry? Can I add one more egg yoke into this recipe? 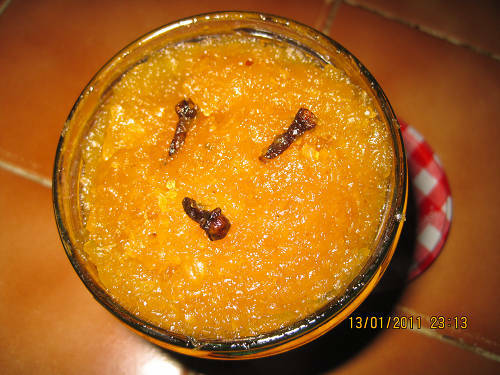 This recipe was submitted by my fan. Normally speaking, if the crust cracks, it's highly probable that it's too dry. Was your yolk too small? Add a bit more then. You might not need one more whole egg yolk, just a bit, depending on how dry your dough was. Second year making this Pineappe tarts as small gift to family and friends. Timing is always right with the Aussie pineapple season. So glad to read your comment. Wonderful. The Aussie pineapple is so fragrant and sweet, good for making these treats.